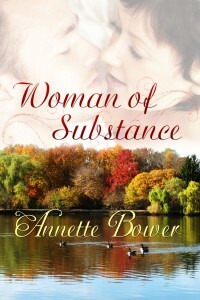 Woman of Substance is a blend of Women’s fiction and Romance. Women’s fiction includes subjects and themes that range beyond romance. Woman of Substance is a contemporary story where Robbie is the star of the story and her growth and emotional development is foremost. Woman of Substance is a story that centers on primarily on women and on society’s view of women’s bodies. This is a subject women can relate to in their real lives. Professor Jake Proctor and his dying grandfather, Frank, are catalysts for her growth. We’ve all met a man who we hoped would grow to understand the importance of many things in a woman’s life and when we have found him we hope for a long term relationship. But this takes time. This story is built upon a foundation of friendship and shared experiences. My stories are relationship stories. I like to discover what is under the persona that we present to the world whether it is a costume, an affected, learned response to situations. I want to know more about people. I’m interested in why people do what they do. That is why I write to try and understand and perhaps share the tiny bit of what I have learned with my reader through a well told story.